“Lighting the shadow, a woman / crawls out beneath her own war.” Thus lines 27 and 28 from the first poem in the book deliver both title and theme. Working as a frontispiece, “The Dead Will Lead You” creates a sprawling image for the reader, introducing a troubled landscape that the speaker (and, by extension, the reader) must fight through. The landscape: a country with “scarred meadows, red / blue, white. The star-flung sky scrapes / gold grass” – an untethered world populated by statues, cries, and animals, “ashen hills, the expanse of desert / shorn with prayers.” Such is the wild, vivid, grief-ravaged vision Rachel Eliza Griffiths invites the reader to witness. “At the gates there is a figure believed to be a man. Placed upon a pedestal his head is raised & turned […] As though he is listening for permission from the stone he is.” Thus, even the inanimate object may have the power to hear, rejecting the idea that anyone or anything is unaffected by its surrounds. 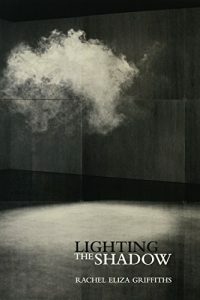 The poems’ fierce and unflinching gaze leaves little unseen, parsing devastation wrought by loss and heartbreak that spans both personal and public histories, intertwining them with new and ancient mythologies, homages to the dead, and stark examinations of violence in the world we live in. Standout lines abound: “The eyes of your killers are dry. / The eyes of your killers are dry;” “I hang my flesh on the French door as her light shakes my hunger into sequins;” “The smell of captive animals drags its truth beneath the breeze;” “I am giving you the image of our insides splayed like wings in daylight. I am giving you the opposite of the negative, which is fire.” Lighting the Shadow’s relentless intensity sears afterimages in the reader’s mind, fueled by a duende that stirs emotion like so much alchemy. Tough with feeling and far from sentimental, Griffiths’ poems use the artist’s eye for detail to suffuse into and extract meaning from emblematic referents to the phoenix, all kinds of birds, flowers and flame, rolling heads, ghosts, always women, and of course Frida Kahlo. The poems often behave as a kind of psychological ekphrasis – a woman in situ with mythology and memory, acted upon by greater forces than simply human. While messy at times, that messiness can be said to mirror the nature of life itself. The sprawl of heart and hurt serve to heighten the urgency behind the book’s composite of human evolution—spiritual, emotional and bodied, completely in the world, however wrecked, and even, at times, finding joy. Griffiths writes: “Ruin, I have lived / inside your estate,” and guides us through that living with compelling and difficult beauty. Khadijah Queen is the author of Conduit (2008), Black Peculiar (2011) and Fearful Beloved (2015). Individual poems appear or are forthcoming in Fence, jubilat, Tin House, Memoir, The Volta Book of Poets, Women Write Resistance and widely elsewhere. She won the Leslie Scalapino Award for Innovative Performance Writing in 2014. This entry was posted in Reviews and tagged Four Way Books, Khadijah Queen, Lighting the Shadow, Rachel Eliza Griffiths. Bookmark the permalink.